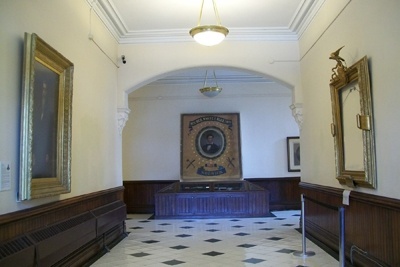 The town of Norwich, CT is sponsoring a contest: the idea is to copy the painting on the left, which was stolen from City Hall in 1994 and never seen again. Norwich cares very much about this painting because Lincoln gave a speech there in 1860 as a Presidential candidate, and because a local artist painted the portrait. The best copy wins and will be bought by the town and displayed in the original frame. This isn’t about Lincoln’s assassination. (For that, The Conspirator movie which comes out this week looks pretty good). 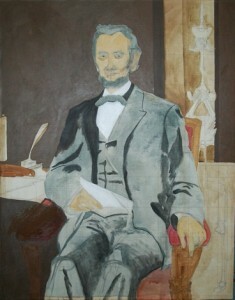 This is about the theft of a portrait of Lincoln, painted by John Denison Crocker, which hung in City Hall in Norwich, Connecticut for almost 130 years until it was stolen in 1994. The thief cut it out of the frame, right off the wall, and presumably walked out the front door and into the street, never to be discovered. The front entrance of City Hall faces a busy traffic rotary, several other businesses and City buildings, multiple residences, and a small park area. There was no hope of being completely unseen, so I imagine the thief took a moment to roll the large canvas and tuck it under his arm, purposefully walking out of City Hall as if they were architectural plans and he had every right to be carrying them. Now, almost 20 years later, the police re-opened the case, at the same time as the Slater Museum sponsored a contest to replace this symbol of town history and civic pride. I’m entering the contest–yes me, an abstract painter, painting a historical portrait. I like the challenge, and I want to see Norwich get its portrait back. Also, I hate art theft, where something that’s created for the public and brings beauty into the world is removed and hidden away. A stolen painting is too recognizable to be sold or displayed officially, and so it might sit in a closet somewhere. At best, it’s been installed in a secret viewing area, where the thief might privately enjoy it. If so, it’s a very selfish act, and a sad end to a work that was intended to publicly celebrate President Lincoln. Here’s to catching the art thief. In 1994, City Hall in Norwich, Connecticut was the scene of an art heist. 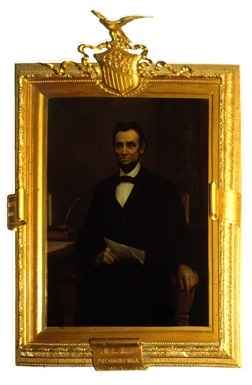 A portrait of Abraham Lincoln, painted by John Denison Crocker, which had hung there for almost 130 years, was cut out of its frame and stolen, never to be publicly seen since. The City of Norwich still has a special feeling of pride for the portrait, so much so that it applied for a grant which has allowed City officials to sponsor a contest to replace the painting. The City has essentially commissioned a copy of the work, which will be culled from contest entries, and plans to install the copy in the old frame, which still hangs in City Hall, an empty reminder of the loss. The reasons that the civic pride for this artwork runs so deep are that the painting commemorates a visit which Lincoln paid to Norwich when he was a Presidential candidate in 1860, and also because the artist was a locally famous painter who lived most of his life in Norwich. The replacement statue is bigger and heavier, presumably to prevent another theft. I understand what it’s like to have an important town landmark stolen. Sterling, Massachusetts, the town where I went to elementary school, was the birthplace of Mary Sawyer, better known as the girl from “Mary Had a Little Lamb”. 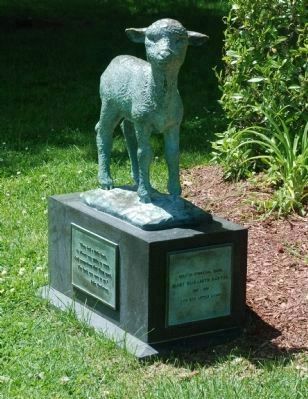 In honor of Mary and her lamb, a statue of a lamb stood on the town green. It’s difficult to overestimate the amount of civic pride attached to that statue; probably everyone in town had had their photo taken in front of it at some point. Years later, when I was in college, I read in the San Francisco Chronicle that the lamb had been stolen, and I still remember the shock as I read the article. Shock that our little lamb had made the papers in California, but also: Who would do that? (It actually turned out to be one of our former neighbors). I imagine that the people of Norwich feel similarly about their Lincoln portrait, because it represents a historical connection to our 16th President, as well as pride for native son John Denison Crocker. Because I understand the pride that a town can have for a local hero and the way that pride can be held in a symbol–like a statue or a painting–I want to replace the Lincoln portrait. Dan Savage and Maura McGurk were both profoundly affected by a series of teen suicides in the fall of 2010. The suicides were particularly notable and received national media attention because they occurred in a cluster, and were caused by acute bullying because the boys were thought to be gay. Ever since, Savage and McGurk have separately been hard at work. From Seattle, Savage created the It Gets Better Project, which provides a platform for adults to upload supportive videos targeted at bullied teens. These testimonials, many by adults who were bullied and attempted suicide themselves, assure young viewers that a happy and productive future awaits them. They ask for patience and perspective, and offer understanding and hope. It Gets Better also became a book, edited from the ten thousand and counting videos, and reached the New York Times Bestseller List in March 2011. In New York City, McGurk began painting a series of abstract paintings about the boys who committed suicide, and the circumstances that emerged about incidents of gay bullying. Classes of schoolchildren have toured her studio to see the work, and the paintings have been exhibited twice since February 2011. McGurk is still adding to the series, and some of the paintings have now found homes in private collections. Enter Dan Savage, again. He came to New York City on the It Gets Better book tour, and took home a McGurk painting titled, appropriately, It Gets Better. Contact McGurk to purchase a painting in support of LGBT youth and take a stand against gay bullying: maura@mauramcgurk.com. I suppose it was just a matter of time before someone played the family values card where my work was concerned. There are many legitimate reasons why artwork might not fit with a particular venue–you have abstract work while they want to show landscapes, it’s too big, too small, too political, not political enough, does not fit in with the theme of “Music on the Boardwalk” etc etc. A lack of space is a sufficient answer all on its own. That they went farther and brandished the families-with-small-children card really got my blood boiling. This is not a new question, and it’s a rhetorical one anyway, but how did the word “family” get co-opted like this? The family I grew up in had gay people in it and we loved them–even as small children. By saying that my work is not suitable for families to view, the gallerist is trying to taint me and my work, which I do not accept. I replied and told them that while I understand my work may not fit the gallery for various reasons, I had to respectfully disagree that it wasn’t suitable for families or children because it is in fact specifically in support of children. Those “family” folks don’t have to like it, but they need to realize that to be against bullying is to support children. My current abstract paintings are inspired by the suicides of several teenaged boys in fall 2010, who were bullied for being gay. The multi-layered paintings use a colorful but unsettling palette of yellow-greens, pinks, purples, reds, and blacks. Some figurative elements emerge, particularly spindly or cartoonish legs which suggest vulnerability. Expressive bursts of drawing come from a personal sense of urgency and upset over the suicides; many pencil marks are not drawn lines at all, but desperate and furious tracks carved again and again through the paint. Dripping, dangling shapes conjure anguish and heartbreak suggestive of the bullied teens, but also of viewers who may look on these stories from a place of adult wisdom and, perhaps, shared experience. My recent trip to Arizona made me remember how much nicer people are to each other outside of NYC, and how hungry I was for pleasant interpersonal connections–at the grocery store, on the phone, passing by…the reason I bring this up just now is because I had a wonderful experience with a company called ArtWeLove, not only from a transactional standpoint, but from an artistic one, since I came to learn about an artist named Sarah Trigg who I really relate to and enjoy. ArtWeLove sells prints of artists’ work, meaning they are not originals, rather reproductions of original works, printed in an edition of, say, 250 on archival paper. During Armory Week, I won an online sweepstakes and a free print. This was exciting, and they couldn’t have been nicer–I even got an email from the person who put my print in the mail, to tell me it was on the way. I chose a print (above) by Sarah Trigg because of the appealing colors and shapes, and because it looks like, and was influenced by, maps–which I love. Maps have inspired many of my own paintings over the years and I could look at them all day long. When I clicked for more information on Sarah, I learned more about her newer work, which are juicy, colorful, painterly paintings (again, very close to my heart) which she created based on an interest in maps, dates and history. So many of my own favorite things–this just gets better and better! It’s really interesting–she chooses a date on the calendar and researches events that happened on that date which affected the landscape, then paints about them. It’s funny how our interests continue to intersect because I did something similar, though on a more personal scale, when I opened old letters I’d received on the same date years earlier and then created paintings with them. In my favorite body of work, her appreciation of the aerial view in a map led her to more fully explore the depicted site, such as researching so-called “reconnaissance photographs” from the Cuban Missile Crisis. Even though these grainy photos show a dirty industrial site that brought our country to the brink of war, I appreciate, like Sarah, the aesthetics of tiretracks in the gravel, and the positions of the tents and fuel trailers on the launch site in San Cristobal, Cuba. There is a beauty there which Sarah distills into her paintings. For me, this rang another personal bell, because some years ago I painted maps of Chicago and was struck by the beauty of the runway patterns at Midway Airport (of all things). Those shapes and visual relationships appeared in many paintings and prints over the years; beauty and inspiration can come from the strangest places. When you visit Sarah’s page at ArtWeLove, make sure to take the Studio Tour; as the camera lingers over her paintings, she gives a thoughtful narrative of her inspirations and how her work develops. I feel like I really understand this artist, and that is rare, but beautiful when it happens.